Amazon Web Services (AWS), Amazon‘s (NASDAQ:AMZN) public cloud division, is the fastest growing and most profitable business division for the company, with reported sales growth of 55% year-over-year (y-o-y) to $3.2 billion and operating income growth of over 100% to $861 million in the quarter ending September 2016. 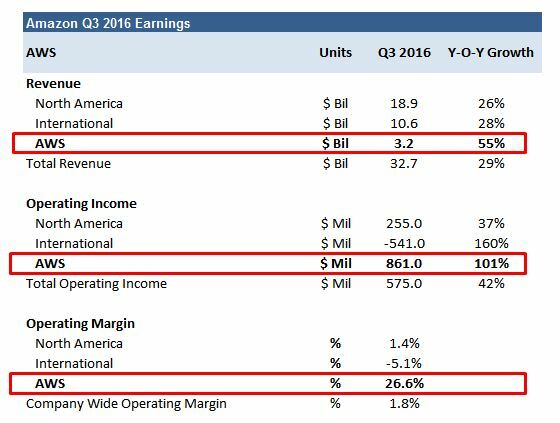 In comparison, operating income for Amazon’s online marketplace business in North America grew by just 37% and the operating loss in its international marketplace business expanded 160% to $541 million in the same period. 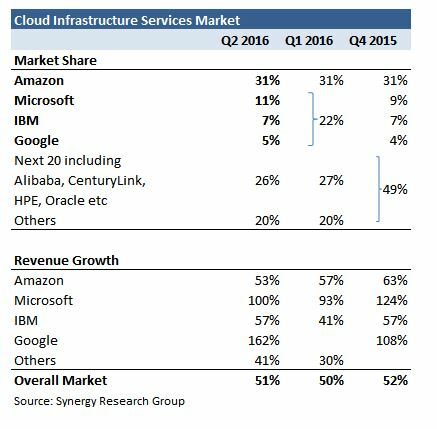 AWS was ranked first again in Gartner’s Magic Quadrant for cloud infrastructure services in Q2 2016, followed by Microsoft, IBM (NYSE:IBM) and Google (NASDAQ:GOOGL). Amazon has been a leader in the cloud infrastructure services market since 2006, owing to its wide array of Infrastructure-as-a-Service (IaaS) and Platform-as-a-Service (IaaS) offerings, and continues to grow faster than the market, thus consistently improving its share. Going forward, we expect Amazon to maintain its share in this rapidly expanding market by diversifying its product portfolio and expanding geographically. In a bid to reach out to all kinds of customers – startups, SMEs and large enterprises – and enhance its agility and customization capabilities, Amazon acquired Cloud9 earlier this year. It also opened two data centers in Mumbai in June in a bid to accelerate the expansion of its cloud services in the Asia-Pacific region.